The Royal York Hotel in Toronto, now called the Fairmont Royal York, is one of those iconic hotels that is steeped in history. Actually one could argue that it created history. Built by the Canadian Pacific Railway, the Royal York opened its doors 1929 to great fanfare. It was one of the world’s largest hotels with its 28 floors; its impressive height making it the tallest building in Canada (a title that only lasted about a year). The hotel had over 1,000 rooms, which was massive and is still huge in today’s terms. There were many additional services built into the hotel, some of which are still intact and some having undergone major refurbishments over the years. 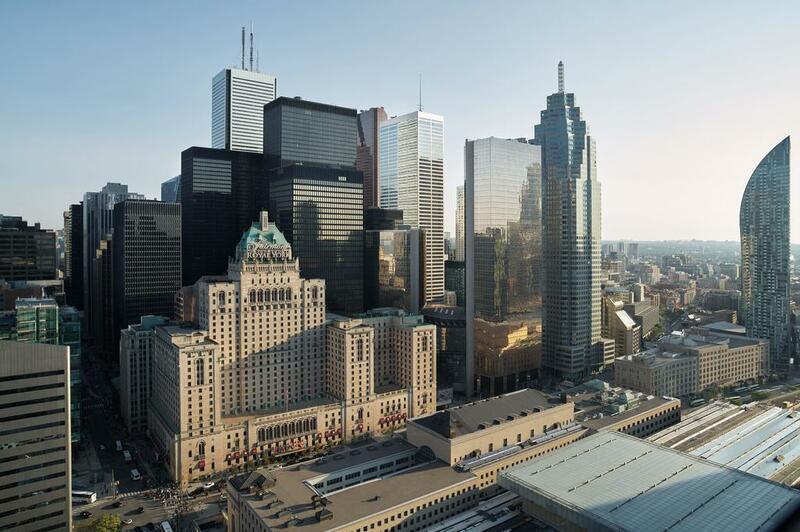 Located opposite Union Station on Front Street it occupies a large site in the financial district of the city. At this point in its history it would be remiss not to focus on the ownership of the Royal York by the Fairmont hotel chain, who purchased the hotel some years ago. The Fairmont hotel group is regarded as one of the world’s best known luxury hotel groups with a reputation for hotels that are highly distinguished for their style and architecture. The Fairmont group are also leaders in the promotion of best environmental practices which extends way beyond the regular options of reduced water usage to the protection of various biodiversity issues under threat. One of these initiatives is that of bee keeping and the Royal York in Toronto is home to a large apiary of over 350,000 honey bees during the peak summer season. Unfortunately during my stay I didn’t get to meet the bees but as the wind chill was hitting -15ᴼC I thought that any self respecting bee would be staying indoors so I followed suit. Being early March when I visited and with the weather not conducive to being out and about for any length of time I spent a considerable amount of my visit mooching indoors, mostly in the National Museum and AGO (Art Gallery of Ontario). Major refurbishments were taking place at the Royal York during my visit which meant that several areas of the hotel were closed off; this included the main Lobby, Reception and the EPIC Restaurant. The Library Bar, Piper’s Restaurant and the Imperial Ballroom were all still operational and I had the opportunity to visit these rooms during my stay. The Imperial Ballroom is imposing with its sunken central area allowing those on the lookout for fellow friends/colleagues to easily establish identities from the surrounding sides. We dined twice in Piper’s Restaurant and found the food to be good, although a bit on the formulaic side. The staff are well trained and our only real gripe was the noise level. Hard surfaces are very much in vogue in restaurants but designers should remember that guests may want to interact with each other in an old fashioned practice called conversation rather than tuning in to I phones. Our bedroom was located on the 12th floor. It can be a little disconcerting when a porter brings you to your room for the first time and it takes nearly 10 minutes. We were wondering if we needed a ball of twine to find our way back. We figured out that the first long corridor from the main lifts to the first corner was about the length of a par 3 on a golf course. Fortunately we hadn’t golf clubs so refrained from trying this out! However, other lifts were discovered nearby which did bring you to the lower ground floor level (shopping level) so that was handy enough. Using the small gym and stylish swimming pool did require the big walk to the main lifts in dressing gowns. As most other guests were in the same boat I didn’t feel any qualms, particularly as the benefit of a daily swim far outweighed my outdated modesty. Our bedroom was in a bit of a time warp and in need of a makeover to bring it up to modern expectations. It was very small but I expect that in a city hotel. Sadly, the bathroom was also quite dated with shower curtain hanging over a bath. A rather bizarre attempt at reducing energy costs was made by eliminating the hotel manual from the room. I just love reading these manuals from cover to cover so was very nonplussed when informed that I could access this information on the tv. You can therefore imagine my surprise by the waste of electricity. There were old fashioned switches which I carefully turned off every time I vacated the room only to return after the room had been serviced to see at least four lights turned on. Somebody needs to join the dots here. Other rather bizarre details were that you had to request water in the room rather than it being part of the service. The same applied to toiletries. One day we had none and the next we had 6 shampoos following a request. This is not good staff management having to make these separate deliveries. Another tip would be to provide more hangers in the wardrobe. The acoustics also need attention as despite the door looking very solid we could hear people talking clearly as they passed the room. The bed was very comfortable and I did sleep well so the main objective was achieved. There is a lot to love about the Fairmont Royal York and to be fair they are going through a difficult upgrading whilst staying open. It is one of the Grande Old Dames of the hotel industry who has rested for a while on her laurels and has lost a bit of her glamour. It is always tricky getting the balance right when restoring an historic property. The Fairmont expertise should guide it through this transition period. It is to be hoped that The Royal York will once again become a glamorous place to stay in and continue to play host to guests who adore hotels with a personality. Fairmont Royal York Hotel, 100 Front Street West, Toronto, Ontario M5J 1E3, Canada.